Who is Ri Sol-Ju, the wife of North Korean leader Kim Jong-Un? 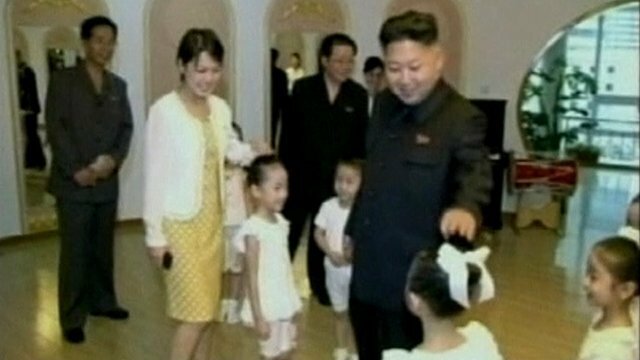 Home World Asia News Who is Ri Sol-Ju, the wife of North Korean leader Kim Jong-Un? More details are emerging in South Korea about Ri Sol-Ju, the woman identified as the wife of North Korean leader Kim Jong-Un. A lawmaker, quoting intelligence officials, said they believed Ri Sol-Ju had visited South Korea in 2005 and had studied singing in China. Other news reports suggest that Kim Jong-Un may have spotted her at a musical performance. North Korea has not given any details beyond saying she was Kim Jong-Un’s wife. There had been speculation about Kim Jong-Un, who took over as leader of the country after the death of his father Kim Jong-Il last year, after he was seen with a woman on various occasions since June. State media confirmed for the first time on Wednesday that leader Kim Jong-Un was married. An eight-minute report on North Korean radio mentioning Ri Sol-Ju’s name was broadcast at 20:00 local time on Wednesday. South Korean lawmaker Jung Chung-Rai told reporters following a briefing by intelligence agents that Ri Sol-Ju was from an ordinary family in Pyongyang. Ri Sol-Ju may have visited South Korea in 2005 as part of the North’s cheerleading team for the Asian Athletics Championships, Jung Chung-Rai said. The cheerleaders are seen wearing red baseball caps, twirling umbrellas and dancing in the stands with tambourines, television footage of the event shows. Ri Sol-Ju is also likely to have “participated in several inter-Korean exchange programmes”, reports South Korean news ageny Yonhap. The paper cited three separate events between 2003-2005 attended by someone from North Korea with the same name as Ri Sol-Ju, including the championships. It remains unclear when the couple got married. Most South Korean reports suggest that Ri Sol-Ju may have been a singer who caught Kim Jong-Un’s attention during a performance. A source told The Choson Ilbo newspaper that a singer with the same name as Ri Sol-Ju had performed with the Eunhasu Orchestra until last year. At least two newspapers, including the Choson Ilbo, say that Ri Sol-Ju has been groomed as the first lady, possibly studying at Kim Il-Sung University. Ri Sol-Ju’s Western-style dress and short cropped hair have led to speculation over whether Kim Jong-Un has a less traditional, more international outlook than his father.